James Harris Gallery | Evan Nesbit: "Headstand"
James Harris gallery is pleased to present our first solo exhibition by Evan Nesbit. Painting has been defined as a two dimensional work made by an artist using pigment with a binder to create a wall-bound object that embodies an image or an idea. In the 1970s artists expanded and pushed the boundaries of art making in media, form and content. Nesbit draws on the history of painting and extends the exploration of these ideas. The artist’s practice is more than a re-examination of the medium; he has developed a distinct visual language through his use of materials. Nesbit brings a theoretical approach to his work that is concerned with aesthetics, perception and image production. 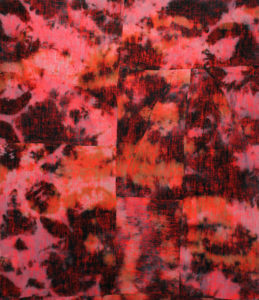 He pushes acrylic paint through the open weave of the burlap from behind. 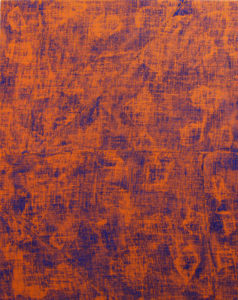 The physicality of the lumps of acrylic against color of the burlap gives the work an optical effect. 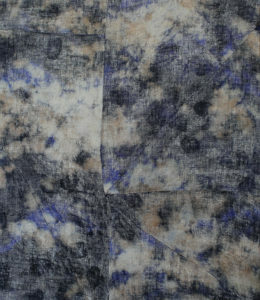 In some works, the burlap has been dyed and cut and sewn together before it is stretched. The seams act as a demarcation of geometry connecting two chromatic areas. By dying the support structure, driving the pigment medium through it, the artist seamlessly integrates the medium with the support creating an aesthetic teleology through an inverse logic that at once offers a way into and out of understanding. Nesbit’s works investigates the threshold that exists between perception and the visual systems within the language of painting. 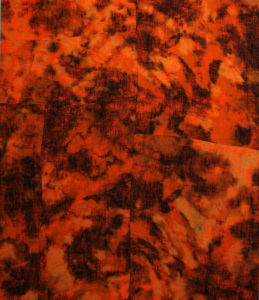 The viewer is asked to engage in a complex relationship to the work, as both a physical confrontation through which they are interpolated by an object/image that disavows its referentiality, and as a conceptual exercise that questions our culturally embedded preconceptions of the medium of painting itself. The work becomes a mirror, a contradictory surface that we are only able to decodeby looking through and beyond it. Resisting its own objecthood, the work creates an embodied struggle for the viewer who must contend with their own aesthetic enticement and the risk of unconscious absorption. Evan Nesbit received his BFA from San Francisco Art Institute in 2009 and his MFA from Yale University in 2012. 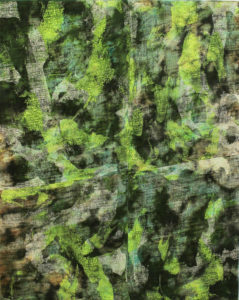 He has been awarded the Yale University Ely Harwood Schless Memorial Fund Prize for painting.